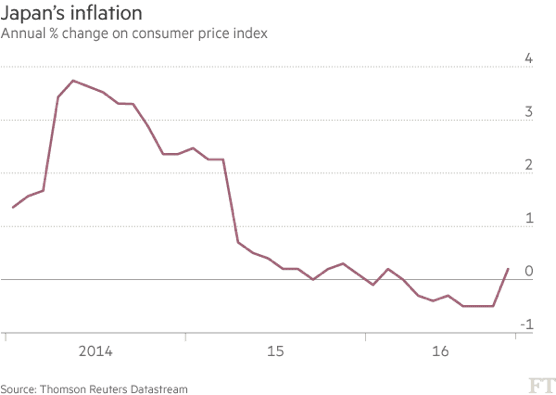 Japan’s inflation data for the last part of the year have come out and they show a shy but positive growth in both the Consumer Price Index and Bank of Japan’s preferred index, which does not consider fresh food and energy. The increase was determined mainly by three factors: BoJ’s recently policy easing, Japanese Government’s fiscal stimulus that is starting to hit the real economy and the weakening of the Japanese Yen with respect to the US Dollar. Haruhiko Kuroda, governor of the Central Bank, and Shinzo Abe, Japanese prime minister, have put all their effort during the last few years to fight the decade’s pattern of on and off deflation. The former one implemented a monetary easing in 2013, successfully boosting inflation up to 3.5%, however, as an increase in taxes hit the economy shortly after, BoJ’s effort were useless. Inflation has kept decreasing until recently this year when in turned into deflation. In September, the BoJ committed to buy any amount of bonds in order to cap the yields on 10-year notes at 0%. They are also aiming at overshooting the 2% target inflation rate and by achieving that, they hope to change people’s expectations for the long term level of inflation. If they manage to do so the real interest rates on debt will decrease benefiting the overall economy as debt burden will be lower. However, after the failure of 2013’s policy, the BoJ has lost most of its credibility. Investors are not likely to believe that the new policy will have a positive effect and they are also starting to think that the BoJ has not many bullets left to support inflation and the real economy. For this reason, inflation and depreciation of the Yen are not to be attributed mainly to this change in monetary policy, other factors are more likely to have had a greater effect. Abe’s government has been focused with reviving the economy and helping the country get out of the deflation loop. To this purpose it has started the privatization of many public companies and it has also set up a fiscal stimulus that is now starting to hit the economy. It will increase consumption and investment and therefore help inflation. However, the biggest hopes for Japanese GDP growth and inflation lay under the recent depreciation of the currency with respect to the US Dollar. In the last week, the Yen has in fact lost 10% compared to the American currency. The effects of this shift are enormous and they will trigger an increase in exports and a decrease in imports. This in turn will fuel GDP growth and inflation. US Presidential elections and the imminent rate rise by the FED are to be mostly blamed for this. 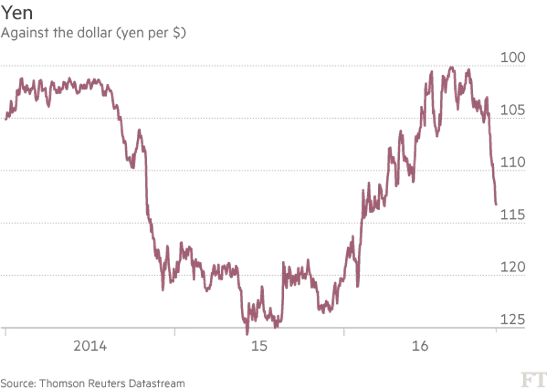 Mr. Trump’s will most likely bring a wave of isolationism and of fiscal easing in the USA and this has made investors shift their money toward the American market as hopes of higher returns are materializing. Moreover, the rate increase that will be probably implemented in December will attract more capital in the US as any interest rate is better than the 0% offered in Japan. The overall effect was the strengthening of the American Dollar that has now reached an 8 months high with respect to the Yen. Japanese economy will benefit from these changes and this can be testified by analysts raising estimates for inflation to 1% and GDP growth to 2/3% for 2017. Japan might just get out of the deflation loop once for all.